I was born in 1970, seemingly on the cusp of transition from modernity to postmodernity. Maybe no one knew it at the time? After all, we were putting men on the moon. Didn’t it seem like everything was still possible then—that our future was wide open? I took to heart the words of Disney World’s Tomorrowland jingle: “There’s a great big beautiful tomorrow/ Shining at the end of every day.” (One of the Sherman brothers more annoying efforts.) Tomorrow would be made possible by G.E., the Carousel of Progress told us, and maybe we believed it… As long as the Russians didn’t drop the bomb first. That was then. Having lost faith in progress, we’re now supposed to be postmodern people. You think? It is a kind of faith, that’s for sure—even though it’s premised upon faith being made obsolete by Reason. Methodism: Insert your own punchline about being watered-down here. I just finished reading Christian ethicist (and fellow United Methodist) Stanley Hauerwas’s essay entitled, “The Radical Hope,” about a Christian understanding of family (versus popular pseudo-Christian or sub-Christian alternatives).1 He argues that there is a sense in which Christianity challenges the human family. He doesn’t quote next week’s “Relatively Speaking” text, Mark 3:31-35 (“Who are my mother and my brothers?”) but he may as well. In a section of his essay, he seeks to illustrate ways in which our Christian faith challenges traditional family allegiances. Allow me to share this heartbreaking passage. Emphasis is mine. Ouch! Is it really so bad, Stanley? Well, maybe so… But as much as I love Hauerwas—and few thinkers challenge me more to consider how demanding it is to follow Jesus in this world—I often think the only way to be the Church from his point of view is to become separatists, like Anabaptists (e.g., Amish or Mennonite). Still inasmuch as we Methodists are watered-down, I happen to know there are a lot of us Methodists who are not happy to leave it that way! 1. Stanley Hauerwas, “The Radical Hope,” in The Hauerwas Reader (Durham, NC: Duke University Press, 2001), 505-518. O Lord, our heavenly Father, almighty and everlasting God, who hast safely brought us to the beginning of this day: Defend us in the same with thy mighty power; and grant that this day we fall into no sin, neither run into any kind of danger; but that we, being ordered by thy governance, may do always what is righteous in thy sight; through Jesus Christ our Lord. Amen. Our sermon series on family relationships in the Bible continues with “Relatively Speaking, Part 4: Husbands and Wives.” We’ll look at Adam and Eve in Genesis 2:18-25. The service will feature special music and a video of church members talking about their spouses. To get us in the mood, here’s a love song by Van Morrison, which Rod Stewart turned into a monster smash hit in the early ’90s. Enjoy! Don contributed this reflection about his brother for our “Relatively Speaking” sermon series. I think this is exactly right. Notice that the Dalai Lama is not saying that our religious differences are unimportant or (as the op-ed’s headline, “Many Faiths, One Truth” might imply) that all religions are essentially the same. On the contrary, he rightly says that some degree of exclusivity is at the heart of all religions. Christianity certainly has an exclusive component. I am a Christian, after all, because I believe that God is definitively revealed in Jesus. Everything I need to know about God I learn from him—because I believe that Christ is God. There is no necessary revelation outside of Christ. This is to some degree exclusive because where the truth claims of Christianity compete with the truth claims of other religions, I side with Christianity—with the caveat that all human knowledge is provisional. At best, we see through a glass darkly. We should always be open to revising our understanding of the truth that Christ reveals. But our faith is by no means completely exclusive. Inasmuch as other religions reveal this same God, I say a hearty “Amen.” If Buddhism (or any other religion) can teach us something about compassion, then by all means we should be receptive. We’re not surprised or threatened by the fact that we share so much in common with other religions because we believe there is one Spirit revealing this truth. My point (with which the Dalai Lama would surely agree) is that we don’t get along with people of other religions by minimizing our differences or pretending that they don’t really matter—as many well-intentioned Christians have tried to do by redefining “salvation,” for instance, to some lowest common denominator. No. We can hold onto our exclusivity while at the same time respecting, admiring, and appreciating other traditions. In fact, we must: otherwise we tell practitioners of other religions that their traditions’ unique and competing truth claims don’t really matter. How is that not offensive and disrespectful? See earlier entries here and here for more on the challenge of religious pluralism. 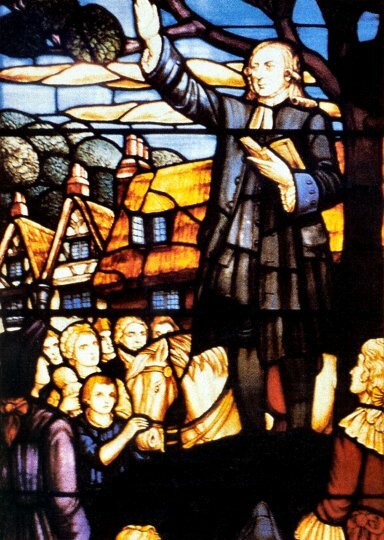 Today, 24 May 2010, is Aldersgate Day. Wesleyan scholars debate the meaning of Aldersgate. Was it a full conversion to faith or a formative spiritual experience? (I believe the latter.) Wesley himself rarely referred to it after about 1740. One thing is certain: Wesley, who had previously struggled to believe that he was truly a Christian, found in Aldersgate a sense of assurance that he was forgiven, loved, and accepted by God in Christ—a conviction from which he never wavered. Assurance continues to be an important emphasis in Methodism. In general, we Christians ought to be assured by the Holy Spirit that we will be saved. It shouldn’t be something we worry about. …In the evening I went very unwillingly to a society in Aldersgate-Street, where one was reading Luther’s preface to the Epistle to the Romans. About a quarter before nine, while he was describing the change which God works in the heart through faith in Christ, I felt my heart strangely warmed. I felt I did trust in Christ, Christ alone for salvation: And an assurance was given me, that he had taken away my sins, even mine, and saved me from the law of sin and death. 15. I began to pray with all my might for those who had in a more especial manner despitefully used me and persecuted me. I then testified openly to all there, what I now first felt in my heart. But it was not long before the enemy suggested, “This cannot be faith; for where is thy joy?” Then was I taught, that peace and victory over sin are essential to faith in the Captain of our salvation: But that, as to the transports of joy that usually attend the beginning of it, especially in those who have mourned deeply, God sometimes giveth, sometimes with holdeth them, according to the counsels of his own will. 16. After my return home, I was much buffeted with temptations; but cried out, and they fled away. They returned again and again. I as often lifted up my eyes, and He “sent me help from his holy place.” And herein I found the difference between this and my former state chiefly consisted. Here’s the 250th Aldersgate anniversary address from 1988, in St. Paul’s Cathedral, by Dr. Donald English, a British Methodist scholar. Queen Elizabeth II was in attendance. On the heels of the New York Times article I refer to in my previous post, I came across this Times blog entry yesterday. The blogger writes with polite incredulity that, according to a recent survey, 82 percent of Americans believe that God is intimately involved in their lives. She used as a case in point a recent contestant on American Idol. After Simon Cowell predicted that this person would soon be voted off, the contestant pointed upward and said, “I know God,” indicating, I suppose, that God would take care of him. Even after getting voted off a couple of episodes later, the contestant maintained, despite his setback, that God had something good in store for him. The vast majority of comments in the comments section predictably scoff at all these ignorant Americans for being deluded, superstitious, and childishly naive. How can we believe that, A) there is a God, and, B) even if there were such a being, it personally cares about us—given so much evidence (i.e., science and human suffering) to the contrary?1 Even some of the God-believing commenters complained about athletes’ and celebrities’ public displays of piety: Why should God care about trivial events like ballgames and other mundane details of a person’s life?